I have high hopes that my Blog30 project will help me to finally write all of those posts that I have had rattling around in my head. I don’t know if anyone knows what I mean by this, but I always have things in mind that I mean to write about, and I keep these running commentaries going so I don’t forget them. I “write” the posts while I am driving, or while I am washing the dishes, or weeding, only they never see the light of day. From the dusty crypts of my mind, then, here is a book that I have been wanting to write about since the summer. 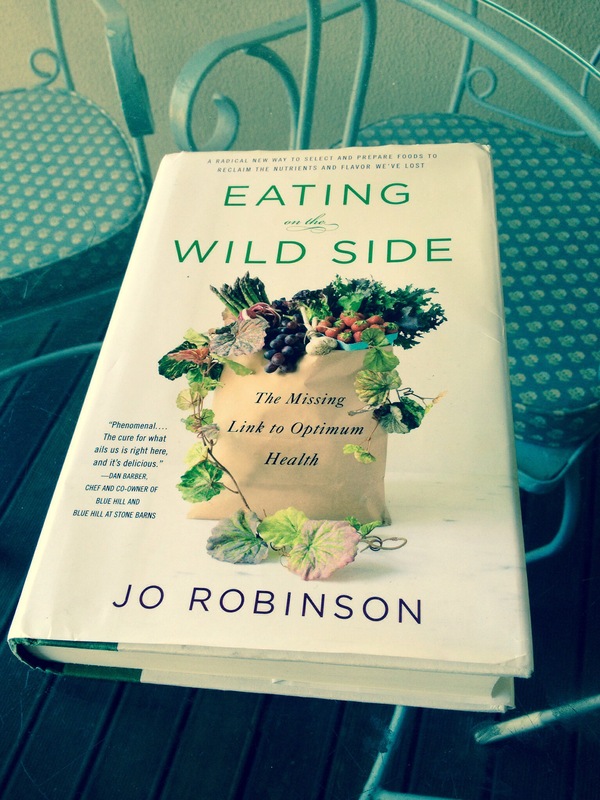 It’s called Eating on the Wild Side, by Jo Robinson. I heard an interview with her on NPR’s Fresh Air, and it was so exciting, I rushed to get the book. Robinson is a reporter who has written extensively about food, and the entire thrust of the book is to look at vegetables that we eat today, compare them to their wild ancestors, and teach us how to get the most nutrition out of the varieties available today. For example, she recommends that when you pick or buy a head of lettuce that you wash and tear the whole thing immediately. Doing so will cause a stress response in the lettuce leaves, thus making them more nutritious. The torn leaves can then be stored in a ziploc bag that has had holes poked in it with a pin for several days, just use the torn leaves as needed. That is just one of many interesting facts about how to prepare vegetables and fruits to optimise the nutrition we get from them. As if that were not enough, it is clear that Robinson is also a gardener. She shares interesting tips on varieties of vegetable to search for to try in the garden and notes on growing conditions. These are all laid out in charts at the end of each chapter, along with hints for supermarket and greenmarket shopping. It is all very exciting, and as a result I am growing shallots for the first time this year, and favoring red lettuce over green. I’m so glad you learned something new here! You know, I think that writing things down is the thing that really takes ideas from mere thoughts to something that can grow; I’m going to try and get more ideas down on paper so they don’t all get lost in the soup! Why poke holes in the plastic bag? I store lettuce just as you’ve described but I’ve never poked holes in the bag. Not sure that I understand the logic behind that. I’ll have to try that lettuce bag tip! For me, the best part is having lettuce that is ready to go – I can be a bit rushed preparing meals, at times.